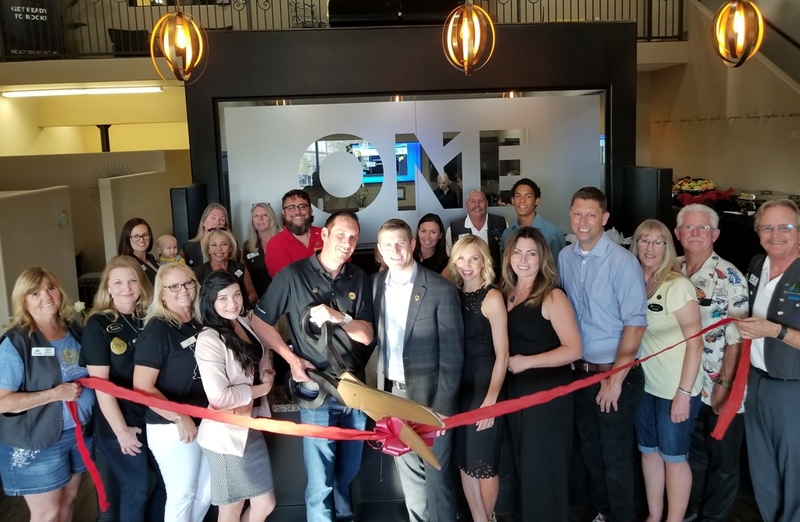 The Lake Havasu Area Chamber Ambassadors held a ribbon cutting ceremony for Realty ONE Group Mountain Desert – Collins Team celebrating its grand re-opening of its new office location. After 3 years, Realty ONE Group Mountain Desert has 80+ agents locally & 320+ regionally, with six offices to serve you. Its beautiful new 6000 sq. ft. office location is at 1971 McCulloch Blvd. N. #102. Realty ONE Group is a fast growing franchise nationally, here to help develop the best Realtors in the market. Attending the ribbon cutting from left to right were: Sharon Oakley, Angie Lottridge, Trisha Kem, Hannah Johnson, Jeff Collins – co- owner, Daniel Collins – co-owner, Jennifer Collins, Mimi Lindy – Broker, Jeff Hoover COO, and Steve Bentley.